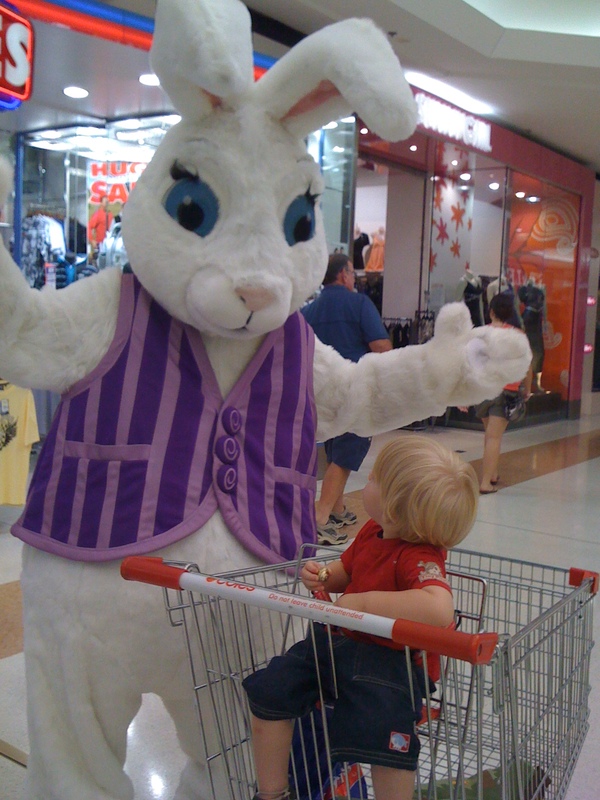 (nearly) Wordless Wednesday- Meeting the Easter Bunny! Today we had the great pleasure of meeting a special frined of mine, the bringer of all things chocolate, the symbol of new life and all round good guy- The Easter Bunny! Who knew that only 4 days before his schedule heats right up he would be hanging out at a local shopping centre. His helper was very lovely too, making sure he didn’t careen into any unsuspecting children. She was quick too, managing to jump out of the picture just in time. Unfortunately, this pic doesn’t show the look on Smidge’s face- a blend of horror and intrigue! Hehe, well he came out smiling in the end, especially when he realised the little egg he had been given was chocolate! Majority of my kids have freaked out at that age with people in suits. And for one it lasted until he was 4! ooh all three of my kids would have been petrified – even the six year olds…. but he looks so cuddly!